How could I forget it? I bought it from Sewill's of Liverpool on 3 December 1988. It came with two eyepieces, a 25mm Huygens and a 16mm orthoscopic with cross-wire insert. I first used the Telementor the following day, when I projected the Sun on to a hand-held paper 'screen' using the 25mm Huygens eyepiece. It wasn't a very satisfactory test, but it was enough to tell me that there were no obvious faults with the instrument. That evening (4 December 1988) was unfortunately cloudy, but with one or two small breaks in the cloud cover. It was also very windy, but I noted in my log that the tripod stood up to the gusts of wind very well. The first star I inspected was Castor (x53). At that power it formed a neat figure-of-eight (bear in mind the two main components were much closer then than they are now). I noted in my log that a higher power would certainly split the pair. At that time, I didn't have any 24.5mm barrel eyepieces of higher power, so I had to wait some weeks before I could confirm that the Zeiss would indeed resolve Castor easily at higher magnification. I won't list all the other objects I managed to glimpse in the gaps between banks of cloud, but they included some old favourites such as the Crab Nebula (M1) and a personal favourite of mine, the Sword Handle double cluster in Perseus. A star test showed that I could penetrate down to magnitude 12, even using a low power (x53). When asked my favourite Brahms symphony, I have to say it is the one I last heard! And my favourite picture of the Virgin is always the one I last looked at. So my favourite place for observing with the Telementor is - wherever the Telementor happens to be at the time!. More seriously, I don't take the refractor away from home, and so it has only ever been used at two sites, both in Chester, England. I have to say that I liked the old house better, and it had a larger and darker garden, but I am quite happy observing from my present back garden. It is a typical English suburban site. It enjoys generally good seeing from late Spring through to early Autumn, and generally poor seeing during Winter. The transparency is not good. As a rule, one can see down to about 4.5 with the naked eye. Magnitude 5 is a good night. On one phenomenal occasion, it was just possible to get down to mag 6, but even nights of 5.5 are very rare. Double stars and the Sun, but I also enjoy observing Venus and occasionally the Moon. My passion is for doubles. Despite its limited resolving power, the Zeiss is an ideal instrument for observing bright pairs. It produces textbook diffraction patterns that are seldom seen in larger telescopes, even of high quality. I love to push magnification to the limit when observing double stars, frequently going above x200. This is almost impossible to answer, as my Telementor has given me such stunning views of so many objects. I am constantly surprised by what it will show. However, if I am forced to select the most memorable view, it must be the Shoemaker-Levy 9/Jupiter impacts of 1994. I decided not to use my 8.5-inch reflector for these impacts, as I wanted to gain an unbiased view with the Telementor. That week was the most extraordinary of my observing career (so far). The impacts were easy to observe and draw. Subsequently, several of my drawings were reproduced in the Journal of the British Astronomical Association, in the Jupiter Section's detailed report of the event. The drawings had no intrinsic merit, of course, but their interest lay in the fact that they showed what a tiny refractor had been able to show. 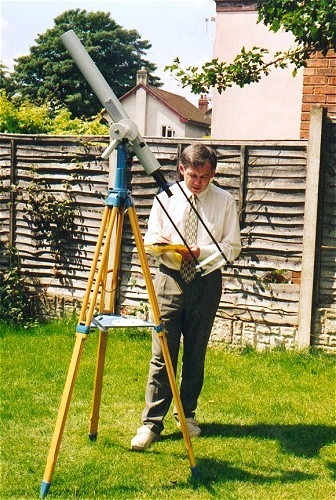 Mine was the smallest telescope to contribute observations to the Jupiter Section. In addition to the original two eyepieces supplied with the telescope, I now have quite a battery of extras. I have added several Zeiss eyepieces, including 10mm and 6mm orthscopics, but I now also use an adapter that enables me to observe with my 31.8mm barrel eyepieces as well. Perhaps my favourite gadget is the Zeiss slitless pocket spectroscope I purchased early in 1989, which has given me many hours of pleasure. I also (sometimes) use a Zeiss eyepiece turret, and for observing the Sun a Zeiss projection screen (very sturdy and strong). More recently, I have acquired a second-hand Zeiss position circle for double-star work. Finally, I should mention my ring micrometer (again made by Zeiss), a wonderful device. Yes, I have compared the Zeiss with other telescopes. I have compared it with my 8.5-inch Newtonian reflector, but the comparison is hardly a fair one. Obviously, the larger instrument will show far more, and it is better for serious work such as double-star measurement. But the Zeiss gives exquisite images and is so easy to set up and use that I almost always use it in preference to the larger telescope. I have also compared it with a Vixen 4-inch achromatic refractor and a TAL (Russian-made) 4-inch achromat. Again, the Vixen and TAL were more powerful, as you would expect, but I prefer using the Telementor because I find it so much easier to use, and it gives better images. Seriously, though, I would say that its advantages far outweigh the disadvantages. The only drawback in my opinion is the small aperture, but even so the Telementor will easily outperform most 3-inch telescopes. No, I have no other comments - except to say that the Zeiss Telementor is by far my favourite instrument, and I can not imagine ever changing that opinion.